Will kids be more willing to eat properly if they're taught to get excited about food, cooking and nutrition via their computer screens? Two new US online series are banking that kids are hungry to know that both good food and good times can be had in the kitchen. Kids Who Love to Cook is a web program that follows the basic cooking show format, with kids demonstrating recipes from start to finish, learning cooking techniques and discovering where food comes from. KickinKitchen.TV is a self-styled "comedy-cooking mash-up" along the lines of Glee, with its teenage cast involved in singing and comedic scenarios. Both shows have guest stars: "Kids" features various achievers in a segment called Breakfast with Champions, while superstar chef Daniel Boulud and Green Bay Packer Greg Jennings make cameo appearances on KickinKitchen. The series keep kids front-and-centre - cooking, tasting, experimenting, interacting in fast-moving, colourful segments that focus on good-for-you food without getting too preachy. "We show it, we don't say it," says Giselle Deiaco, the NY-based Kids producer and creator. "I don't think kids want to be lectured or scolded to eat healthy. If my mum told me that, I'd probably do the opposite. It's - I don't know, a bit holier-than-thou posturing and a tad puritanical, this healthy food monoculture." That translates into one cast member cooking up Wiener schnitzel, mentioning it's traditionally eaten with potato salad, and then noting she likes a green salad better. 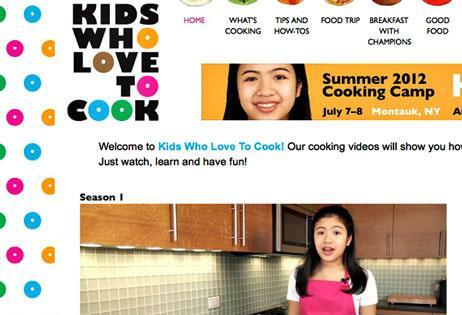 Kids Who Love to Cook also fosters community through its website, kidswholovetocook.com, and by offering food camps, merchandise, contests and other activities. As for KickinKitchen, producer and creator Natasha Lance Rogoff says the show doesn't just say, "here's an egg", but sings about it too. The healthy message is more overt but wrapped in glossy production, music and "tween-friendly" recipes. For Rogoff, the key is getting viewers to relate to the characters, four teens who host an online cooking show, and thus become inspired about cooking, start cooking, then share videos and recipes with others at the series website, kickinkitchen.tv. "It's timely, topical and, as we know, people are watching these things online," says the Boston-based Rogoff. "I think there's a tremendous interest coming from young people now. Lots of kids are watching the Food Network ... Kids are becoming aware of food in terms of identity, pleasure and enjoyment."